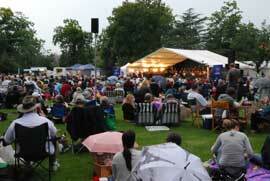 Stonnington Symphony orchestra play a free concert in Malvern Gardens, Malvern every February. Bring a picnic and a rug and relax listening to them playing 'Symphony Under the Stars'. ........To tell the truth, I've no idea how much competition there actually is for this title in Melbourne but there were a load of stalls up too, indicating it's a well run and popular event. ........It's 7 or 8 eight kilometres from Melbourne CBD. There are a couple of railway stations within about a 1.5 kilometre walk if you don't have a car. 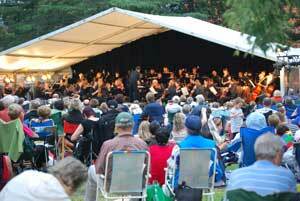 Click onto Stonnington Symphony to find their website to get the date of the next free February concert. Here's where they play - click on the blue writing 'Stonington Symphony Orchestra' underneath the map below and then click the - button at the top left of the map a few times to see where the Gardens are in relation to Melbourne city centre.